The views are amazing from this characterful property. Lollo and her son Anton were very helpful, friendly hosts. Luxury property in a pedestrian area for demanding aestethes with every convenience incl a magnificent view over the city and the Med and with 5 min to shopping, restaurants beach. Furnished for 4 persons with posibility for 3 extra beds. Add €100 per extra person and week. This is a real gem of a house nestled in the hillside near the castle. We travelled with 2 children (ages 5 and 9) and we all loved it. The house is beautiful with modern comforts like hi-speed wifi and air conditioning. 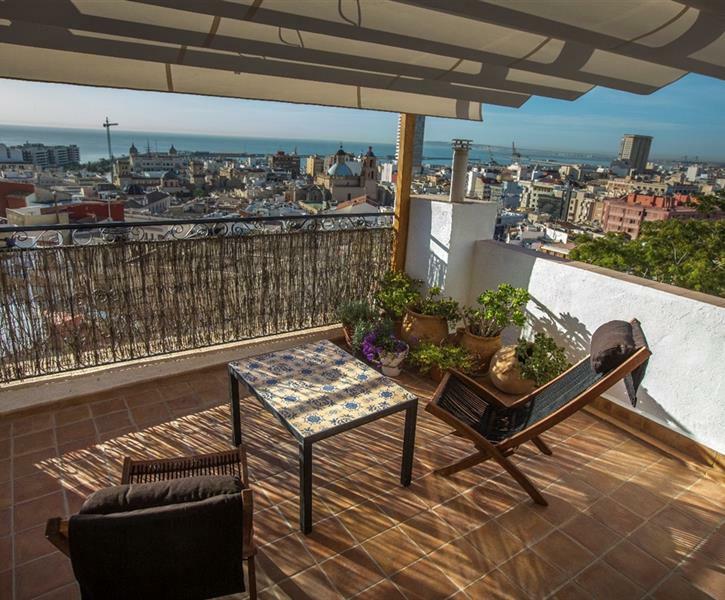 However, it also has the Spanish charm with outdoor cooking available and a great balcony area. It is in a quiet location, but very close to town for restraints and bars. It is also only 5 minutes walk to the beach and less to the tram which will take you to miles of sandy beaches within 15 mins. All in all this is a fantastic property with all modern comforts and we will definitely be back! Highly recommended. This property is every bit as attractive as it's photographs. The townhouse is spacious and well equipped , and close to the Central Market for fresh supplies. We were very taken with the roof terrace and it's splendid views.